Recap: If you’re intrigued by the Etan Patz case or have ever wondered what really happened to Amelia Earhart, this is the book for you. Horrible Man tells the true story of an unsolved double murder that took place in Portland, Australia more than 20 years ago. 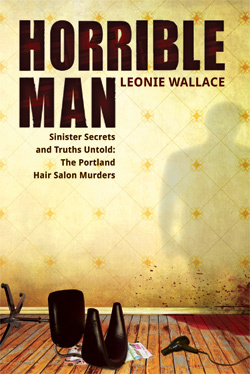 Called the Portland Hair Salon Murders, journalist Leonie Wallace writes about the homicidal act that led to the deaths of Claire Acocks and Margaret Penny. Acocks was doing Margaret Penny’s hair at her weekly appointment when someone came into the salon and savagely killed the two women. Over the years, people have come forward, admitting to seeing a person flee the scene or hearing screams coming from the hair salon, but it has never been enough to pinpoint who did it. And after 20+ years of a case unsolved, many wonder if police will ever come to a conclusion about what happened. Leonie Wallace takes us through the evidence, the police interviews and statements given by witnesses and family members, as well as insight from personal interviews she conducted with all the key players of the devastating tragedy. Wallace also discusses other similar murders that took place in Australia around that time. She talks about some of the prime suspects — and why they were never arrested or convicted. But most importantly, Wallace investigates who Claire Acocks and Margaret Penny really were, and how their loss has affected an entire community. Analysis: What’s most intriguing about the murders is the fact that they happened in broad daylight on a Friday afternoon in a commercial downtown area. Before starting the book, I found myself wondering how something like this could possibly happen and go unsolved for this long. But Wallace’s journalistic prowess and research proves to us that there are so many different avenues, so many different options about what could have happened. Without proof and a lack of reasonable doubt, you’ve got nothing but a mystery. Wallace writes the book in a way you would imagine a journalist would write it — straightforward, factual, mostly unbiased. While Wallace weaves in some of her own experiences about researching the case, she does an excellent job of simply informing the reader of the facts and not swaying us. She leaves us to come to our conclusions about what happened, and we find ourselves understanding why police were never able to come to a solidified conclusion. Wallace’s research is extensive. But her interviews with the victims’ family members are easily the most heartbreaking portions of the book. These interviews are seamlessly woven into the facts of the case in a way that makes us want to finish the book in the hopes that there will be a happy ending, despite already knowing that is not the case. MVP: Mr. Acocks and Mr. Penny. It’s impossible not to feel for the two men who lost their wives that day. It’s a shame that they have no clue as to why this happened or who did it, and that they probably never will. But their ability to continue living their lives and moving on as best as they can is inspiring. Get Horrible Man on your Kindle for just $9.99. Or in paperback for $29.22.